Writer-director-star Zach Braff announced that Kate Hudson will play the female lead in Wish I Was Here. 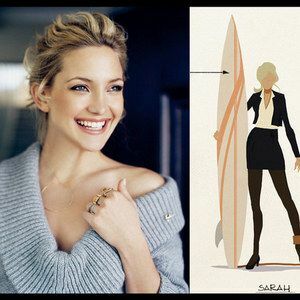 Take a look at the photo that includes a concept illustration for Kate Hudson's character Sarah, the wife of Zach Braff's Bloom, along with his full update from his Kickstarter page, which includes the cast he has assembled so far. "The character of Sarah (my wife) needs to be pretty, funny, believable as a mother of two children ages 5 and 12 and an actress who's skilled at both comedy and drama. Years later, we have become good friends. There's an added benefit in already being close with the actor playing opposite you; a familiarity that's real and isn't forced. As we shoot in August, I loved the idea of jumping into this movie-marriage with someone with whom I've already shared lots of laughs. The story centers on Zach Braff's Aidan Bloom, a struggling actor who can't quite provide for his family. When his father (Mandy Patinkin) becomes ill, he reluctantly agrees to home-school his father's young children, which forces him to learn a lot about himself in the process. We'll keep you posted as soon as more casting updates are announced.